This call for entry presented a difficult task at hand. Due to the numerous and fascinating submissions the criteria was definitely elevated. An interesting side note is the amount of images with a child or children as the subject. The image chosen for first place does a remarkable job of revealing the emotions emitting from the subject without actually giving the viewer a clear gaze into the eyes. Through the reflections of the glasses we are still able to understand the feelings that are projected. The second place image is unique in that, although a viewer may be distracted by the entire image of this young girl, one is directed back to the eyes. Her gaze is not exactly innocent and somewhat unexpected. The third finalist takes on an engaging task of revealing the inner thoughts of two sisters. The contrast between matured, worried concern and fearful innocence in their eyes’ is poignantly displayed. Honorable mention recipient Eric Bladholm gives us a stark and somewhat unforgiving gaze at reality in his image “Reflections.” Jodi Champagne’s image (untitled) exudes a seductive mix of beauty, mystery and hope. In “Frozen” Johan Jagnet uses color and distortion to display beauty mingled with sadness and hints of teardrops. 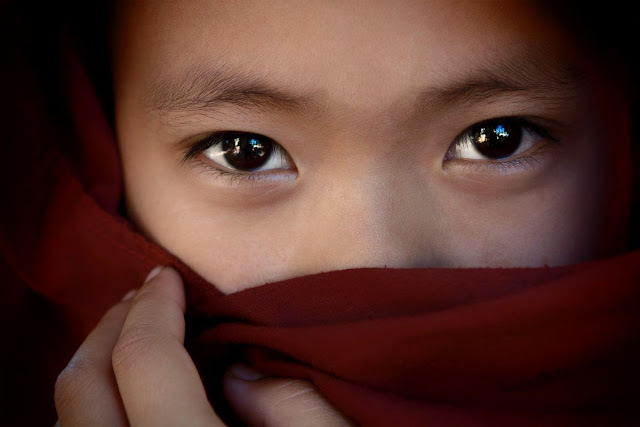 Congratulations to the finalists of the 2013 PictureCompete call for entry “The Eyes” and much appreciation to all participants! I genuіnely treasure your рiecе of wοrk, Gгeаt post. 12 comments so far. What do you think?